The Greek Crisis put very, very simply. Because, in fact and in effect, it is very simple! Imagine this scenario: Great grand parents were told by a banker that they should avail themselves of the bank’s offer of very, very cheap and very, very simple loans. Your grand parents agreed and they borrowed some money. One might, if one is cynical enough, add also that the banker has advised them to borrow more, rather than less. I remember reading the words of the wise capitalist Onassis who in his wisdom about capitalist ways, said, “borrow much, rather than less so you can complete the project you borrowed the money for,” or words very similar to these. So your grandparents borrowed the money in what looked like benign conditions and manageable interest rates. However, something happened -and a lot can between borrower and lender- and the bankers change the conditions and, more direly, the interest rate, which they raise to such a level that the borrower simply cannot pay the instalments. The can was thus kicked along the path of time until you came along and things simply didn’t turn good. In fact, they have turned aggressively bad. The interest rate has increased even more, the economy has left you unemployed and with barely enough income to put bread on the table. You have no hope of ever making the next payment. The instalment is greater than your income (GDP, if we’re talking national). But the bank insists that, once again, you must borrow more money to help you make the next payment. In fact they have lodged themselves into your house and began examining your every move, telling you to sell everything you possess at give-away prices. They have their eye on your precious possession and they want them for themselves and for their mates. They want everything you own and they want you to work for them, the bankers and their criminal associates and STILL keep making those payments! As an individual little pawn in a capitalist market you have no way out of this. They take everything, including your second pair of undies and you are left to wander the streets, hungry, barefoot and with severely soiled undies. Yes, you can work for these crims but at slave conditions and for wages set by the Gina Rineharts and the Christine Lagardes of this world. However, as a sovereign State, and one that has been locked up into contracts and agreements that were nothing short of criminal, such as trade agreements that locked you out the market place and further out still of negotiating prices for the traded goods, and thus, out of earning any income at all, or like having to work with a currency over which you have no control at all and which is controlled by the bankers in the club, you can do a number of things. And Greece is at this very point of the negotiations now. The bankers are screaming “not fair” and the mongrels of the opposition, who feel, as do all fascist Tories, including our own in Australia, that they were born and chosen by god to rule and have never in the History of Greece been in a real opposition, (since they were always a duopoly), are screaming even louder, two- and three word slogans, no more sophisticated than those spat out of our own leader’s mouth. “Pay the debt, pay the debt,” they shout and bark like barnyard dogs. I have staged a most unabashedly simple scenario. Others who wish, may add the complexities and the more nuanced complexions of this moral dilemma as they see them. In the end however, it is a scenario about criminals, going back a long way… to the days when Germany herself borrowed an enormous amount of money from Greece and, at the same time, devastated the country. She has neither paid that loan back nor made any reparations for that destruction. This recession was due to the loss of control of the economy by Howard in the early 1980’s and the stockmarket crash. My first home loan was taken out four moths before that crash. By that time at least banking practices had been tightened up compared to the Howard era when banks were charging 10% above the official rates through a series of cocktail loans. My first loan was 15.5% over 25 years. The bank manager told us to factor in a 2% rise and try to keep our repayments at any elevated level if we could afford it. Some of the best advise I ever got. we paid that mortgage off in 5.5 years even with high interest rates as we were affectively making double payments in the end. That recession gave the country a quarter century of prosperity and growth. But what have wee learnt from that. Anyone who is under 40 has not worked through a recession, doesn’t recognise the signs of a housing bubble or that the economy is starting to tank. We also have a Treasurer that is losing control of the economy as well. We even have these young guns telling us that talk of a recession is false, more fools them. Yes, I’ve worded that wrongly, Alge. I didn’t mean it to sound as if the rates went up because of Keating but, as an era, which encompassed that “recession Australia had to have” statement. I was, in fact thinking of the late 80s-very early90s when they were around the 16% and 17%. I remember interpreting in courts for people who had lost everything and were near suicidal. I should have been more careful as I was writing the piece but I was asked to do it and do it in a hurry by a friend in Greece who has his own blog. I’ll let him know of the correction but that won’t be relevant to him, in Greece. Many thanks for the observation. I think were there greed part of that argument could be the lending practices which emanated from Howard capping interest rates at 13.5%. Banks couldn’t lend at that rate so they produced these things called cocktail loans where money came from various sources. These things bit people that had them and like your argument when things are benign things are good. As we know Keating floated the dollar. A good thing which has protected the country. Banks on the other hand encouraged people to borrow in foreign currencies. I always remember when I when I went of travelling in 1985 that the day I purchased tickets etc that the dollar was worth 0.73 pence. By the time I went three months later it was $0.52 pence then dropped below 0.50. In the same way these people who had being encouraged to take these loans seeing the value of their loans rise at a far greater rate than their repayments. Many went under. The reality is that these loans thanks to Howard’s ignorance meant that a loan taken out at say 14% turned into something like 20 or 30% in real terms. It always strikes me that Liberals think they are great economic managers. When I look a fools like Howard and Hockey as well as fair weather sailors like Costello, I wonder how any sensible person could come to that conclusion. Great stuff, Alge. They are not doing such nasty things because they are fools, though but because they are nasty. Avaricious shits who want to destroy whole economies and take them over. It’s the sole purpose of zionowall st: World Hegemony. It’s one arm of it. There is also the cultural colonisation, the military build up and application, the taking over and corrupting one significant institution after another. Both our “parties” are their parties. Incidentally, the Speaker of the house, (Mz Konstantopoulou) is pushing Tsipras to default and, as well, is trying to get writs up to sue the IMF and the EU for the crimes they’ve committed upon the Greeks through their austerity impositions. She’s a bloody good international lawyer and she’s been advised by the UN that she has a strong case. I understand. I also read another story of how the woes came about – a few years ago. I wish I had kept a link to it. It sort of fits in but takes a different angle. Amounts to the same thing in the end. 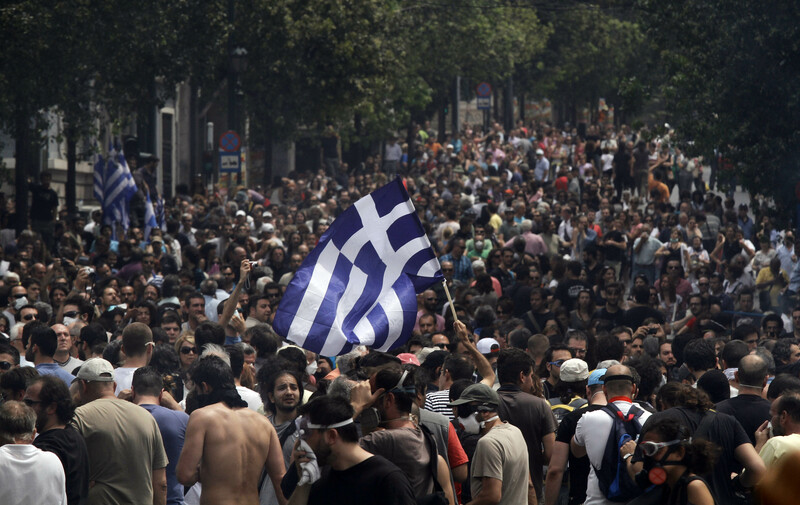 Greece was screwed by others and came undone not so much by their own actions as others.